This L.A. post is way over due. I've been putting it off for several reasons. The vegan options in L.A. are overwhelming in the best way and I visit L.A. quite often. These factors put together mean a HUGE post, a.k.a. lots of time. But I will be procrastinate no more! L.A. is a vegan mecca with new vegan restaurants popping up all the time. So much to do, so much to eat and this is only a handful of the vegan options in L.A. As I continue to visit, I will be sure to keep updating this post. 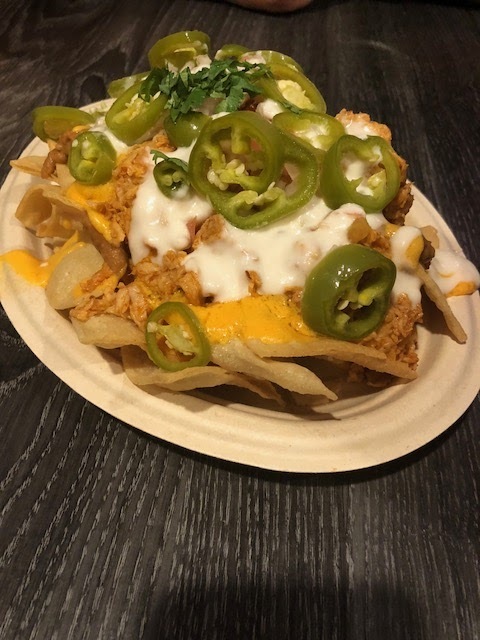 Read on to witness the ridiculousness of vegan L.A. I have to say that I think Little Pine is my favorite vegan restaurant in LA. The Silver Lake restaurant is owned by the musician, Moby and all profits from the restaurant go to animal rights organizations. Their dinner is small plates that you all share with your table and their brunch (my favorite), is served as individual portions. The restaurant is nice and bright and parking is easy to find, something that I am always happy about. 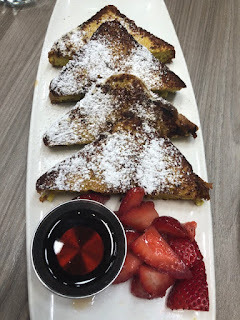 My favorites for brunch are the lemon poppyseed pancakes with coconut whip and fresh fruit, the french toast with maple butter, powdered sugar, and berries, and the biscuit with housemaid jam and maple butter. My husband loves the tofu scramble with mushrooms, bell peppers, onions, house sausage, tempeh bacon, pico de gallo, house salad and toast and chocolate croissant. Everything we have tried there is amazing and the atmosphere matches the quality of the food. Little Pine has a completely different vibe for dinner. The restaurant is dark and is mostly lit by the candles on the tables. As I mentioned, their food is served as small plates and there are quite a few to choose from. We shared the crispy smashed potatoes with romesco aioli, the macaroni & cheese with gluten free pasta, housemade cheese sauce, toasted breadcrumbs, and the stuffed shells spinach & ricotta, marinara, and housemade cheeses. Carbs much? But they were all glorious. Little Pine is a hit no matter what time of day you arrive to fill your hungry belly. I never miss it when I'm visiting LA and you shouldn't either. 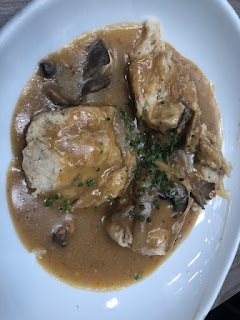 I've been to Sage several times and I remember always enjoying my food, but I honestly can't remember what I've had there! I prefer their Culver City location because it's bigger and they have a really nice outdoor seating area. I doubt you would ever have trouble getting a seat at this location. They serve brunch, lunch, and dinner so pretty much any time of day you can enjoy a meal at Sage. Sage is a place I would like to frequent more often when I'm in LA. Kitchen Mouse is a very cute all vegetarian cafe. It has ample seating with big windows. The highlight of this cafe is it's atmosphere. We arrived for breakfast before starting the drive back to the bay area. We got a seat by the window and it was very nice with the sun shinning in. The place was pretty empty when we got there but by the time we left it was filling up quickly. I ordered the Full English Breakfast, which included, bakes beans, roasted mushrooms & tomatoes, tempeh bacon, veggie sausage, poblano mashed potatoes & peas, toast and tofu scramble. You also had the option to have eggs instead of the tofu scramble. Of course I ordered it with the tofu scramble but lo and behold, it came out with eggs. When it came back with the tofu scramble the food was basically room temp. Maybe it's because I had several amazing cooked breakfasts in Ireland a few months ago, but this paled in comparison. It wasn't horrible but I won't be getting it again. Matt ordered the Jo's Breakfast Sandwich with griddled millet toast with smashed avocado, tofu scramble (also egg option), arugula, chipotle cream and chili lemon dressing. He also added tempeh bacon and a side of poblano mashed potatoes & peas. He really loved this meal which gave me some hope for this place. I think I would try Kitchen Mouse again but I wouldn't be ordering something different from their menu. When we first started traveling to L.A., Flore was a place we always stopped. They have a huge menu and a great dessert case. It's a small, cramped space but they also have some outdoor seating. They also lost power on more than one occasion while we were eating there. Brunch at Flore was always a favorite of mine. The food has always been good but lately we started just stopping by for dessert and then not at all. If you've never been there you should for sure check it out but with so many vegan options in L.A., it's not on the top of my list when I'm visiting for a few days. If you have a special occasion to celebrate or you are just in the mood for a fancy vegan dinner, than Crossroads is the place for you. I've tried their brunch and dinner. As with Little Pine, their brunch and dinner have very different atmospheres. When brunch is being served the restaurant is full of light and much less crowded. We had the caesar salad, a favorite of my husbands, the pancakes, a favorite of mine, the tofu scramble, and the chicken and waffles. The servings are pretty small so you get several things and share! Everything was great at brunch but dinner is when Crossroads really shines. The restaurant is dark and mostly lit by candle light. We have been to Crossroads quite a few times for dinner but on our last visit we tired the black pepper parmesan cheese with house made crackers, the heirloom pizza with pesto, almond ricotta, fresh basil, and parmesan, and the grilled vegetable lasagna with eggplant, zucchini, squash, almond ricotta, and putanesca sauce. In short, everything was amazing. But not as amazing as the dessert we ended the meal with. We ordered the chocolate lava cake. This thing was out of this world. If I didn't have some amount of self control I could have eaten 5 of them. Crossroads is on the expensive side but it's worth at least one trip if you love some good fancy vegan food. Shojin is a place that will surprise you. It's an all vegan sushi restaurant in downtown LA. It's located in a really weird mall, behind a very ominous curtain. Once you pass through the curtain you'll see what all the fuss is about. It's so nicely decorated inside that you quickly forget that you are eating inside a mall. The staff is so nice and attentive while serving some amazing funny named sushi. Some on my favorites are the Pirates of the Crunchy roll which has fried tempeh and gluten-free tempura flakes mixed with spicy mayo on a cucumber, shiso and avocado roll and the Crunchy Dynamite roll which has mashed avocado and chopped cauliflower on an asparagus carrot roll topped with crispy potato served with soy-free dynamite sauce. If you're looking for the best vegan sushi in LA, then look no further than Shojin. RFD is a vegan staple in LA. Brunch, lunch or dinner you can't go wrong at Real Food Daily. I'm partial to the brunch they offer but everything is good. Last time I was there I had The Weekender which has tofu scramble, onions, tomatoes, cashew cheese, tempeh bacon, hash browns, and two pancakes. Drool worthy plate of amazingness. 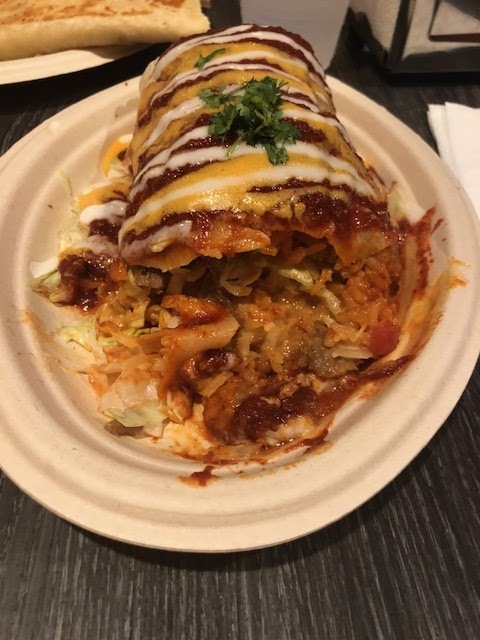 Another favorite is the breakfast burrito which has whole wheat tortilla, tofu scramble, roasted potatoes, black beans, tempeh bacon, caramelized onions, cashew cheese, guacamole, pico de gallo, and hash browns. Also, amazing. Real Food Daily is not to be missed for any meal when you're in LA! Doomies is a little hole in the wall vegan restaurant that has some great comfort food. Make sure you come here hungry. It's an unimpressive place in a nondescript strip mall, it's dark and the service is usually really slow. Did I mention that even with all of these issues, I still love this place? I do! The food is great and the portions are pretty big. There is just something about it's unpolished nature that suits me down to the ground. I love all of their chicken dishes, including the Chicken Parm sandwich with breaded chicken with marinara & cheese on a sub roll. I've never had anything here that I didn't like. Oh, and if want a vegan big mac in your life, make sure you ask for it because it's not on the menu. Doomie's is at it again. Next door to their original location, they have opened Doomie's NextMex, which serves texmex food. Ordering is all by screen and it's kinda hard to get help if you want to speak to a human. 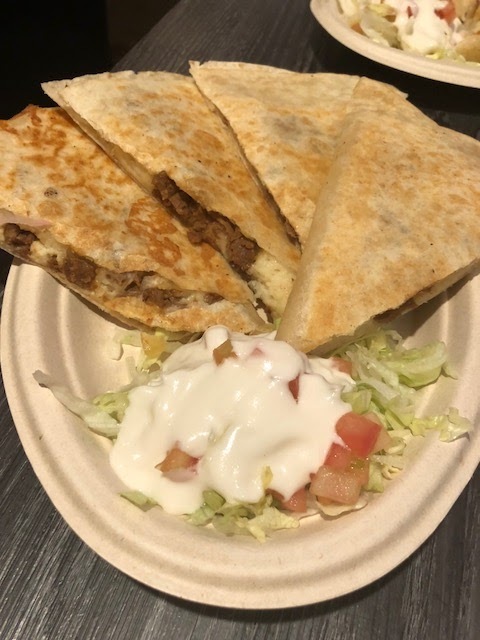 I ordered a wet chicken buritto and a steak quesadilla. My husband ordered the same quesadilla and the nachos. He really liked everything but the only thing that stuck out for me was the quesadilla which I really enjoyed. The buritto was very bland. I would go back and try it again but I think I would be much more careful with what I choose. I've been wanting to try Mohawk Bend for a very long time. It was also recommended to me while visiting the Mercy For Animals office last year. On our last weekend trip to LA, we made sure to make it there for brunch. While it's not a vegan restaurant, they cater heavily to vegans. I'm a brunch fiend, so that's what I really wanted to check out. To my disappointment, they didn't have pancakes on the menu which is always a brunch favorite of mine. I ordered the french toast which was pretty plain with strawberries and the biscuits with vegan sausage and mushroom gravy. Both were pretty disappointing, which was a shame. 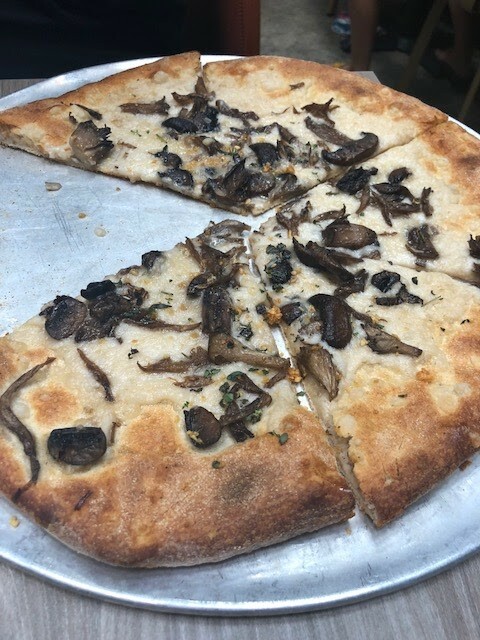 On the bright side, my husband loved the (requested vegan) white mushroom pizza with Kite Hill cheese, oven roasted crimini and oyster mushrooms, frizzled garlic, thyme, sea salt, and olive oil. It seems like pizza might be where their strength lies so if my husband wants to go again, I think that's what I'll try. Donut Friend is a really cool place with some amazing donuts to try. Many if not all of the donut names are takes on song titles and they are very creative. I mean look at these things! And they taste even better than they look. There has been some debate on whether Donut Friend is 100% vegan since my visit, so I would confirm when choosing your donuts. If you love donuts, this place cannot be missed! M Cafe is not a vegan restaurant but has some vegan options if you are in the area and need to grab a bite to eat. I tried the The California Club with smoky tempeh bacon, lettuce, tomatoes, avocado, carrots, sprouts & vegenaise. I've only been there once and while I enjoyed it, with so many better food options in the area, I haven't been tempted to go back. Pomegranate is pretty new to the L.A. vegan scene. It's a really cute vegan and gluten free dessert cafe. We were told by a friend that we had to go there the next time we were in town. Vegan desserts? You don't need to tell me twice! The space is really open and bright and has nice outside eating. It was pretty chilly the weekend we were down there so we opted to sit inside. I had such a hard time choosing which dessert I wanted to try. Sometimes I get presented with too many options and then I cannot make a decision. So I said what the hell, and chose two to have. I ordered the Strawberry Shortcake and the Raspberry Chocolate. Both were so amazing but the Strawberry Shortcake really stuck out for me. It was just perfect! Matt ordered the Tiramisu, which is a favorite flavor of his. He loved it and even let me have a bite! I agree, it was very good as well. Besides desserts they also have some refrigerated sushi from Shojin (they are affiliated with the amazing vegan sushi spot). Matt had to try some and loved it. So they do offer some other items than desserts. Since everything we had there was so good, I imagine that everything on their menu is the same. I can't wait to get back and try more of the yummy sweets they offer. If you have a sweet spot (see what I did there?) for vegan desserts, you need to check out Pomegranate stat. Bulan is vegetarian Thai restaurant that has a TON of vegan options that are clearly marked. I don't dream of Thai food like I do some other cuisines but I did enjoy what I got there. If you are at all into Thai food or don't want a super heavy vegan meal, which L.A. is great for, then I would recommend trying out Bulan. Cruiser pizza is delivery focused pizza place with just a few tables where you can eat in. 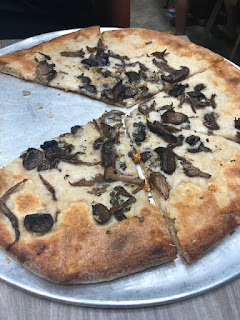 My husband tried the QuarryGirl pizza which had olive oil, garlic base, portobello mushrooms, regular mushrooms, vegan sausage, and fresh basil. He wasn't wowed by it but he did love the house made pesto he added to it. I tried the BBQ chicken pizza that had BBQ sauce, vegan chicken, red onion, cilantro, and Daiya cheese. It was pretty spicy but I enjoyed it! The next time we go there I think we will have it delivered and perhaps try some of the other options they have. Lee Vanween Ice Cream is a fairly new ice cream chain in LA and NYC. They have a pretty big list of vegan flavors and sundaes. I wanted to try The Vegan, which is a sundae with two vegan scoops with cacao nibs, walnuts, chocolate sauce and whipped cream. I chose the chocolate and the mint chip for my sundae and this thing was ginormous. It was very good but if you are going to stop at only one place for a vegan ice cream treat, I would recommend heading straight to Cocobella Creamery. By Chole has made a big splash in NYC, so I was so excited when I heard that they were opening one that would be attached to the Whole Foods 365 store in Silver Lake. Everything I've had there tastes fresh and amazing. I loved the greek salad with chickpeas, cucumbers, tomato, kalamata olives, herbed tofu feta, fesh basil, and dijon vinaigrette, which is much larger than it seems, and the quac burger, which has a black bean-quinoa-sweet potato patty, corn salsa, onion, quac, tortilla strips, and chipotle aioli on a whole grain bun. We have also tried the mac and cheese with sweet potato-cashew cheese sauce, shiitake bacon and almond parm, which was good but didn't really meet my extremely high standards for vegan mac and cheese. On our last visit, we also tried the avocado pesto pasta with avocado-cashew pesto, grape tomatoes, fresh basil, and almond parm, which was out of this world. For dessert, we sampled a huge raspberry tiramisu cupcake that was delicious. By Chole has so many good options, every time we try something new it doesn't disappoint. It's just hard to pull yourself away to to eat somewhere else! Cocobella Creamery is a fairly new all vegan ice cream parlor in the same strip mall as Doomies'. So if you aren't completely obliterated by the amount of food you've had at Dommies' for dinner, you can scoot on over to Cocobella to have some amazing ice cream. When I visited Cocobella on my last visit to LA, I wanted to go all out. I ordered the Magical Unicorn sundae which comes with vanilla cake, Unicorn Magic and vanilla ice creams, strawberry sauce, whipped cream, sprinkles and an animal cookie on top. And it was amazing as it sounds. I mean look at that thing! Cocobella is officially on my must stop list every time I'm in LA. What are your favorite vegan spots in L.A.? Let me know in the comments! You are welcome to share a link to the page but please don't just copy the content over.